Is the one in yor post from our fairly recent horse-trading? Or is the one pictured in your post another recent upgrade? 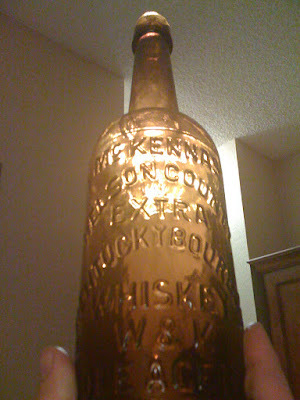 It seems to be the same example (note the large tear-shaped bubble above the K in Mckennas). Here's a quick teaser for the upcoming Las Vegas Show: I purchased/traded for this McKennas fifth at the Vegas 2009 Show! 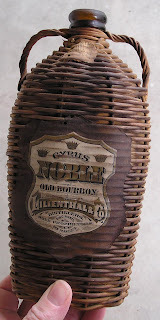 There are always some good finds there....even for the glob top whiskey collector! Here is a recent acquisition. This is the Mc Kenna's without the C&I on the base, and while these are not particularly rare, have been a contender for top 25 status in past years. Most of the McKenna's I have seen have fair to average strikes, and occasionally one turns up with very bold embossing. This is an upgrade for my collection, and is the 6th McKenna's I have owned which were upgraded to this point. Similar to Teakettle,(or any bottle I guess), finding an example with color, character, condition, and strike is not an easy task. I have never seen a McKenna's is a greenish hue, but have heard they come in some great colors. Maybe a McKennas "shootout" might be in order? This is a classic Western fifth that is obtainable, and has great characteristics. Let's see some more! M.E. To really appreciate this bottle you have to be a real connoisseur of Cutter containers. 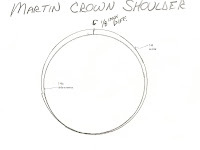 It is usually just described as the "Martin shoulder crown, without circle on the back". That it is.. but there is more to it. This is a completely different mold than the (t-48a), and if recent popular theory is accurate, it is Martin's first J.H. Cutter fifth. We will put a post together next week to get into more detail about the possible time line, but this bottle is larger than the 48-a, has a different base, lettering is larger, and higher up on the bottle. The beginning of the copycat fifths, as E. Martin tried to grab some of the J.H. Cutter magic using containers that looked very similar to Hotalings. This is a real decent example of the t-48. 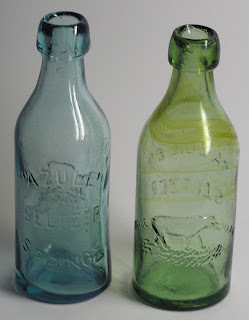 Has a bit of character, they don't have a real wide range of color, which is kind of surprising because this bottle is thought to have been first used in 1873/74. That is prime age for color. Another bottle that has declined in price from the bubble times, but they are still pretty scarce. 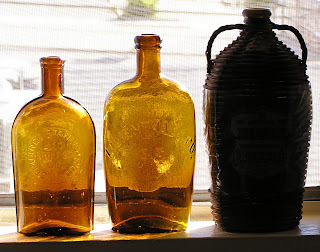 Maybe most collectors aren't all that interested in the nuances of these different bottles. If you are serious about Cutter fifths, this is an important bottle. Reducing the capacity of the container by an ounce and a half, pretty subtle, but say the barrel had 44 gallons, container from 27oz. reduced to 25.5 oz. = 12 extra fifths per barrel. All profit... Have you bought a Hershey bar lately, that's not subtle. They're about as thin as a dime and not even ashamed to raise the price. J. F. Cutter Star in Shield (t-46 Variant B) or Flat "A" Variant. The description has been changed on this bottle. The catalog description is not accurate! Check out the ABA website for the new description. 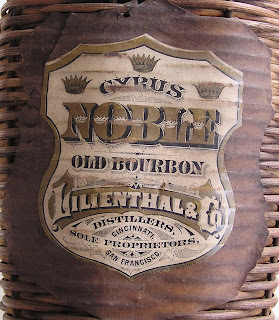 A thin crack was discovered to the right of the embossing. Check out the video for a good look. 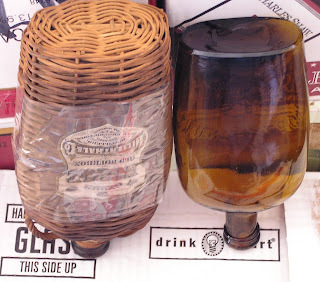 Not sure about the still photos on the website, there are two different bottles photographed..?? 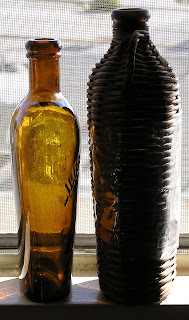 I don't think the bottle shown on the right is anywhere in this auction. I had someone email me this morning about this bottle. Thought there may be a crack or a deep scratch on the reverse. I checked out the video and I saw something at about the 40 second mark that looked like maybe an issue. Check out the video and see if we are imagining this or is there a scratch or crack, a reflection or what? Jeff reported that this is a content level stain line. That's good news, because this looks to be a pretty nice example of this bottle. Also means the bottle hasn't been tumbled. Clean, good "hair on bear". I like it! Just a few months ago we were joking about Cerro Gordo on this blog. Thinking of digging and camping out up there looking for one of these beauties... the comments and joking ring kind of hollow now with the death of Mike Patterson. Mike passed away on Sep. 24th, 2009. He was buried in Chloride, Arizona. The dream that Mike and Jody had to restore Cerro will have to wait for now. 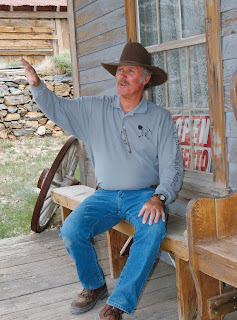 Where the old townsite goes from here is unknown, as far as digging, the town is currently completely "off limits"! I believe there are more of these rare Miller's fifths up in that canyon. They are probably now locked away for good. This particular fifth was found by Mike while doing work behind one of the buildings being restored. It is the one I referred to in blog comments back in June. I am not sure when he found it, sometime within the past 6 years I guess. Cerro was loaded with Miller's fifths. The two times that I dug there in the late 1990's, we found a pile of broken examples. No flasks! All we found were fifths. Always hoped to dig one up there, kiss that goodbye! These bottles were not distributed into very many areas. With Cerro 'off line', the chance of another fresh one finding it's way to market has been reduced significantly. As far as this example, it appears fairly typical to me. It appears to be mint, fairly good strike, no whittle. I looked at it in Auburn and could not find anything real negative to report. Wish it had been cleaned up just a bit, it is hard to lay down this kind of cash for a bottle that has a bunch of junk and rust around the top. ABA has guaranteed that it is perfect! Jeff also indicates that it is darker than other examples that he has handled. I believe he had tried to sell the lightest example known a few years ago, so this one would appear to be darker than that one. Actually, it is lighter than the two examples that have graced my collection over the years. 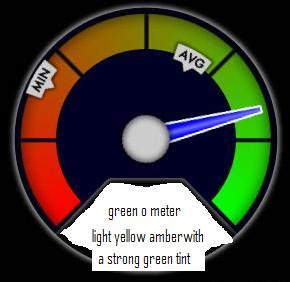 These fifths don't have a tremendous color range, amber, lighter amber, yellow amber. That's about it!! Not known in green. I haven't seen an extremely whittled one either. Just kind of your nice, amber, very rare fifth that happens to have a couple of "older" flask shaped brothers that, together, make a great trio. Also, if you are collecting E.Martin bottles, here is your chance. I guess it is related to the Cutter bottle line up, ? Seriously, this is a good example of a popular 'top 25' fifth. Other comments? J.F. Cutter (t-46 Variant C) or the one with the star on the base. This J.F. variant is interesting in that it comes in a very nice range of color for a late 1870's/early 1880's fifth. From very dark amber through light yellow amber, and sometimes in this nice greenish yellow amber. Is that yellowish green amber or greenish yellow amber, ??? I don't know! It is so hard to tell how green a fifth is without comparing it to other green fifths you are familiar with. 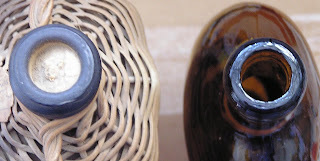 The comparison made with an amber fifth is an good indication that the bottle does have a strong greenish color. Also the bottle looks to be in great condition. Some light whittle, with some nice glass texture noticeable below the embossing. I believe the estimate on this bottle is quite low. A green Variant A would probably fetch triple the estimate on this bottle. The Variant C bottles, in all colors, seem to lag behind the Var. A's and B's. of course the B's don't come in 'great colors'. All hypothetical comparisons aside, this is a nice bottle. I hope the buyer will bring it to the J.F. Cutter Shoot-out at the Reno Show in July. It will hold it's own for sure. Here is a little more to read on S.T. Suit. There has been some information published on him over the years. Jack Sullivan has done a couple of stories about Suit for Bottles and Extras. Not much there about his Louisville activities, which is more relevent to the western bottle that bears his name. I had found some photos from a Louisville historical forum that show the remains of his warehouse after it was destroyed by the windstorm. That site has been taken down. I like the "Established 1839" stuff you always see on Suit advertising. Sam Suit would have been 7 years old in 1839. The distillery (Jefferson County)??? he bought or operated may have been built in 1839. ? Here is a token that Sonny C. of Montana just sent me a photo of. I have seen a couple of these over the years, always seem to have a hole in them. Medicinal use only?? Temperance movement or Civil War tax loophole. ? 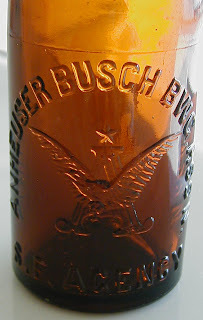 Does anyone have a photo of the amber Salt River Bourbon bottle that S. T. Suit marketed in the East. I have been told that they are iron pontiled. I can't remember if they are embossed "medicinal use only". This invoice indicates that the product was purchased by the barrel. 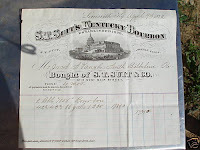 This is what the Walker Bros. were doing in Salt Lake City in 1872-1874. I'm sure glad they went to the trouble of ordering an embossed bottle from a glass house in San Francisco.